Infrared handheld pyrometers with laser aiming beam are ideally for fast mobile temperature measurement such as inspection and maintenance. Measuring range -32? to +760? Each body with a temperature above the absolute zero (-273.15°C =0 Kelvin) emits an electromagnetic radiation from its surface, which is proportional to its intrinsic temperature. A part of this so-called intrinsic radiation is infrared radiation, which can be used to measure a body’s temperature. This radiation penetrates the atmosphere. With the help of a lens (input optics) the beams are focused on a detector element, which generates an electrical signal proportional to the radiation. The signal is amplified and, using successive digital signal processing, is transformed into an output signal proportional to the object temperature. The measuring value may be shown in a display or released as analogue output signal, which supports an easy connection to control systems of the process management. 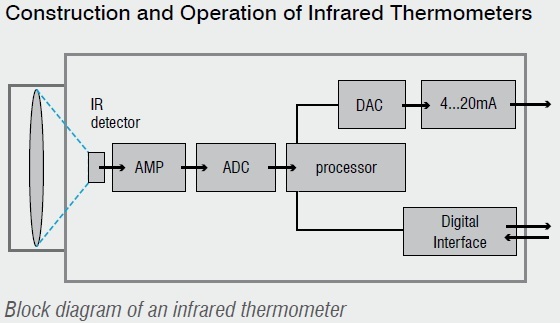 The illustration below shows the general construction of an infrared thermometer. Linearization and output of temperature information. New laser sighting techniques support denoting measuring spots of infrared thermometers as real size crosshairs, exactly matching the measuring spot in their dimension. For more details, please download the Basics of non-contact temperature measurement. IR thermoMeters have various configurations and designs, which differ in optics, electronics, technology, size and housing. Nevertheless, the way of how the signals are processed is the same: It always starts with an infrared signal and ends with an electronic temperature output signal. The LS is the most sophisticated IR hand held device. 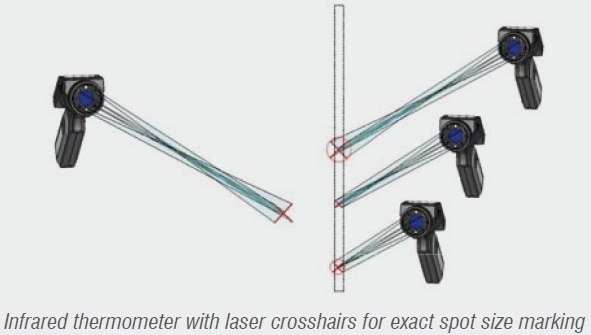 It provides an accurate measurement with its precision optics (adjustable for close or far field focus) and marks the actual true measurement with a laser crosshair, eliminating the guesswork out of handheld IR devices. It is fully programmable, offers a digital interface for on and offline data logging and includes a thermocouple plug in. Please complete the enquiry form below for specific information and advice on IR Handheld Thermometers.